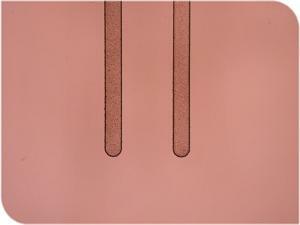 It is called Sintered Diamond Cutter, too. It uses as scribing when you cut brittle materials such as LCD(liquid crystal display) screen or silicon wafer. In comparison with griding stone, this cutter has less machining allowanc and almost no chip or dust. Plus, it does not need cutting oil or water during cutting, so you can do as dry cutting. We will also give you cutter holder and scriber of single crystal diamond. We are producing and selling Diamond Axles for above Diamond Scribe Cutter. We use the hardest type of PCD(Poly Crystal Diamond) for diamond axles, which makes them very tough and abrasion-resistant. We are confident that we will can adjust our product specifications to your needs. which can have a huge impact on your experiments. You can reduce the effect of epitaxial growth and other flaws by this polishing method. We usually do it as 100 and 111. We can polish not only top and bottom surface but lateral side. We can also lap CVD diamond if it has a crystal orientation. We manufacture various tools, from normal ultra precission levels. 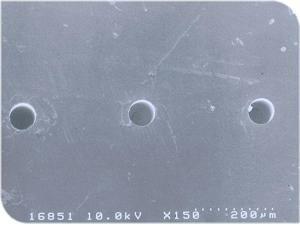 The following pictures show a 0.4mm-wide diamond endmill. Below No. 1 to 8 are main nose shape our end mill. If you tell us your fabrication, we will let you know the best type for you. We provide usual abrasion-resistant parts like WC or SUS. However we recommend to use “diamond” instead of above materials, especially for nozlles, bonding tools or sliding parts. If you use diamond as abrasion-resistant parts, you can reduce tool changing time, or error by abrasion. Those result in a major contribution to your production line. We can supply sample products. If you are interested in it, please ask us details.